Sorry for the delay in posting about this! Well the night began badly as, for some reason, google maps had taken the postcode I'd submitted and thought "ahh, let's play a game of 'send Tara on a wild goose chase' shall we...?" So, instead of finding my way to INC Space (a rather posh health club/gym/events venue) on Grape Street, I ended up round the back of the Ambassador's Theatre with some lovely actors trying to assist me in looking for a road which I assumed existed between two buildings... but in fact didn't! I would like to add that this isn't entirely my fault as I took the postcode I'd found (WC2H 8ED) when I searched for INC Space and typed it into google maps and this is where it sent me! Anyway, I finally ditched the printed map, pulled out my Palm Pre (which I don't tend to use as annoyingly it only seems capable of searching for half a postcode at a time!!) and looked at the maps on there and realised I was in completely the wrong place and had a little bit of a walk ahead of me still! So, eventually I turned up in a sheen of sweat (attractive! ), feeling a little fed up, not to mention a lot flustered and highly embarrassed at being late! 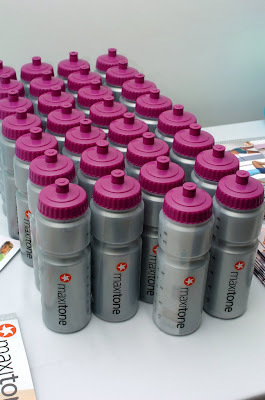 ...after first passing a table and picking up one of the attractively laid out Maxitone water bottles and finding that it contained the yummy Maxitone Sculptress bar I reviewed on Friday. However, just as I was about to enter the room I saw a familiar face, but one whom I'd not seen for absolutely years - Wole Adesemoye!! 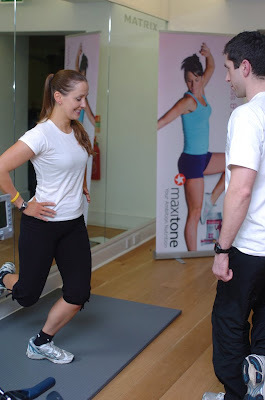 Next I was lucky enough to get a personal training session from a rather fabulous guy called David Perks. He took down some details about me and asked about anything in particular I wanted to address so I told him about my tight hip flexors, dodgy weak ankles and my equally dodgy constantly-injured right shoulder and he set about showing me some really effective exercises to address all these issues. Which was quite a tricky move that involved me standing on one leg and then moving the other round at various angles - hence the clock reference. Fortunately the photographer didn't manage to capture me doing the other move for my hips which involved me kneeling on one leg and then raising the other out to the side (just think dogs and lampposts), although thoroughly unattractive looking it was incredibly tricky, tiring and made me ache a little afterwards - fab!! I really love exercises which just involve your own body weight but have such great results and you can immediately feel working. Last but not least, David showed me the most excellent (sorry if I sound all Bill & Ted here) move for improving my shoulder strength - not actually targeting my delts but working on improving the stability of the whole rotator cuff, specifically (I think) the Infraspinatus muscle. I've been trying to find a picture of this move to show you guys but have been unable thus far - if anyone knows the exact name of the move then please do let me know as I'd be thrilled to hear of it! 2) Prop a bench up so it's at about 45 degrees, then straddle it so you're facing the wrong way - like you're about to do a seated rear lateral raise. 3) Hang your arms over the back of the bench and then bring the elbows up and out to the side as if you were about to launch into the 'Scarecrow' dance move. 4) Holding both weights with the backs of your hands facing up towards the ceiling, slowly rotate your arms upwards until they reach shoulder height. 5) Slowly lower again, then repeat. After my fabulous PT session we were all invited to try out a Zumba taster class which was taken by the beautiful and inspirational Lindsay Jay. I soon discovered that I truly have two left feet and am *much* less co-ordinated than I thought - there's a reason why I only dance when I'm drunk! "Latin and international music are fused to create an explosive, booty shakin’ party of a workout that will target all those problem areas, burn 400 to 1,000 calories a class and leave you on a high!" Lindsay managed to condense a whole class - incorporating all elements of a typical Zumba class - into an intensive 20/30 minute 'blast' which was the most fun I'd had for ages - as you can see from this picture!! Us girls are obviously made of sterner stuff though and we stuck it out. In the pic you can see gorgeous Laura Muirhead - who was the worthy winner of the 'Motivate' category in the Maxitone Body of 2009 competition. Also there is equally lovely Nicky Edwards who was also a finalist in the 'Motivate' category and looked fab! From the 'Inspire' category that I entered, it was only myself and the fabulous Lucie Anslow. Unfortunately our category winner didn't come along as she was quite busy having recently moved into a new place and changed jobs. It was a real shame as I'd have loved to see her again and I don't think hell or high water would have prevented me from attending the launch, especially if I'd actually won our category! I know that it was particularly difficult for Lucie to get away from work so I hope she didn't get into too much trouble and that she has as much fun as I did! 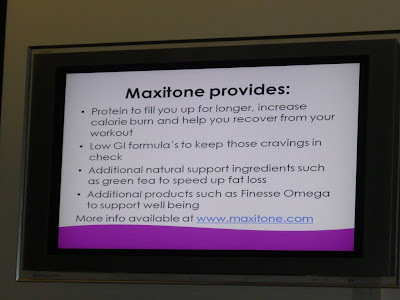 After the Zumba class there was a presentation on the new Maxitone products, the brand and the vision for the women who use it. As I mentioned in my post the other day I find it so encouraging and refreshing that there is a diet and nutrition brand that actively encourages you to go out and exercise! There's so much focus nowadays on simply eating less food, and not enough on actually doing MORE!! 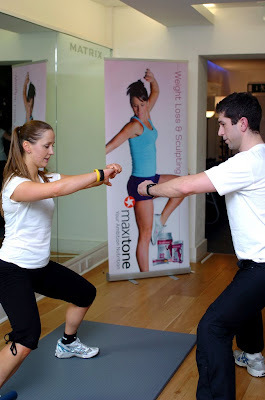 Maxitone is not aimed at people who want a quick fix in return for more sofa & soaps time, they're a company who want you to improve, enhance and ultimately elongate your life by getting active and engaging in physical activity. I'd got engrossed in the presentation and forgot that I had a camera but I managed to whip it out in time to capture this slide which gives you a broad idea about the aim of the nutritional advantages of the products. 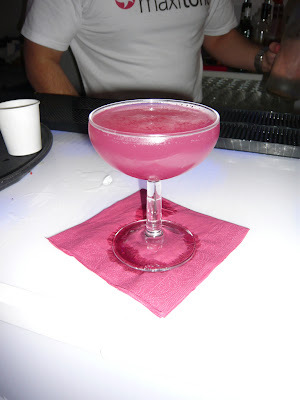 I also couldn't resist the 'Sculptress Martini' - how fab does this look?!! She still looks great mind, although here's her looking even more amazing in one of the pics on her profile page - She was a runner up in the World Sports Model 2009 competition!! Aside from looking great and being a fabulous instructor, she is also lovely to talk to and we had a good old chin-wag. 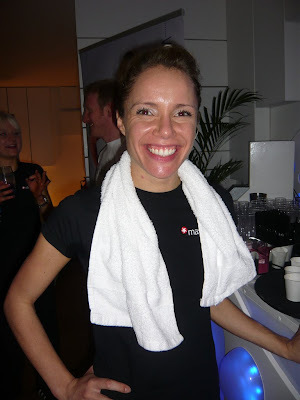 It turns out that, as well as being a Zumba instructor and presenter - representing the brand globally as well as in the UK - she is also running a fabulous brand new exercise class called Disco Health Club, based at the Green Carnation in Soho, London - honestly I don't know where she finds the time!! WHY JUST EXERCISE - WHEN YOU CAN PARTY! This class looks hugely fun and exciting so I'm hoping to pop along one day and check it out - if only to get the opportunity to dress like something out of a Jane Fonda video - long-term blog readers will *know* how much I like dressing up!! 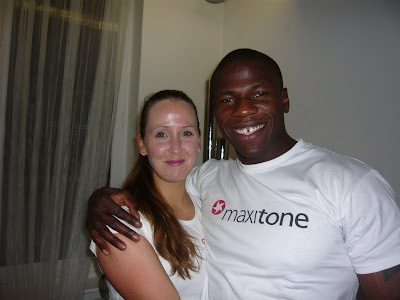 It was great to chat to Lindsay, I love meeting people as passionate about sports and fitness as I am and I think it was quite a coup that Maxitone were able to secure her for the evening as the Zumba class was fantastic and I also can't wait to try one out again. That being said, I think I might buy a DVD first to get used to some of the moves - although everyone can do it, I doubt there are many as uncoordinated as I am, I want to practice at home!! 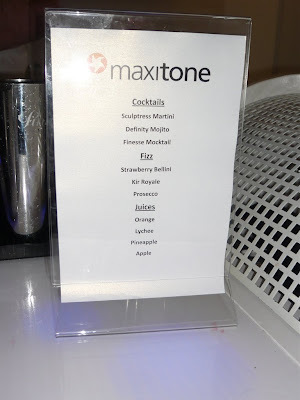 I also had a good chat with Maxitone's nutritionist whose name annoyingly I didn't take down, we were having a chat about using Maxitone products in food as I use protein powder both in my savoury as well as sweet treats, here are some recipes from the Maxitone site. She had some other great ideas that I'm looking forward to seeing appear on the website, especially the one for quiche. She's been a vegetarian for 20 years now so getting enough high quality protein from other sources in her diet is something that's very important to her. Finally I got to talk to Wole later after he'd finished giving a PT session to a lucky lady from Women's Fitness Magazine (one of the women's few women's sports magazines I actually rate as it's not patronising, gossipy and I haven't yet seen an article encouraging you to do biceps curls with baked bean cans). a) he still looks just as good as he did when he was 18 because, as much genetics obviously play a large part in how you look when you reach maturity, if you don't take on adquate nutrition and put the hours of training in as you age, then genetics will only carry you so far and there'll be a very limited timeframe during which you look your best! and b) he's still as passionate about his training and getting results. Whatever he's doing, it's obviously still working and, to top it off he's keen so show others how to reach their potential, which is just fantastic! For those of you who think that Wole looks that way just because he he drinks a few protein shakes and maybe lifts a couple of weights then think again! You don't get to look that good unless you train well, take on correct and adequate nutrition and have a great work ethic to boot! Wole gets up early, trains people until around the middle of the day, then has a few hours which he devotes purely to his own training before he starts his firefighter shift later that day. He works hard and he looks great, he puts the time in and he gets the results out, simple but *definitely* not easy!! I left INC Space with a fab sports bag containing a Maxitone Shaker, snazzy new waterbottle, (though unfortunately no hoodie which was a shame as we thought we might get one), a whole box of yummy Definity Crisp Bars! (review to follow), and a renewed appreciation for the benefits of exercise and good nutrition! I love being sporty and enthusing over sporty matters with equally like-minded sporty people. What a fabulous evening, still grinning, thank you Maxitone!! LOL!! GN I want a hoodie first and I'd *love* some nice samples of maxitone myself - especially the shakes!! P.S. thanks, I did have a layer of foundation though covering my red... though it was threatening to melt off... how attractive am I?! !